Right now, it costs $2.73 to acquire a customer for an Android app. That’s not cheap, and some analysts think that price could double in the next year. Even worse, that figure understates the real cost of acquiring a loyal customer. If you’re not one of the top 60 apps, 80–90% of the customers you spent time and money to acquire will be gone within 90 days. So that average cost of $2.73 to acquire a new app user effectively becomes $14–27 per engaged customer, depending on your app. That’s a very scary number depending on the economics of your business and the lifetime value of your customers. If you want new customers to stick around, you need to make sure that they discover what’s interesting, relevant and unique about your app during their first few visits. If you don’t convince them to return within the first week, you’re very likely going to lose them forever — there are just too many other things competing for their attention. To achieve this, you need to have an onboarding program built into your app, one that shows new customers how to use it effectively and clearly demonstrates your app’s value proposition. But you also need a strategy for re-engaging people who don’t finish onboarding, or don’t experience that critical aha moment, during their first session, which happens often. To that end, we found that sending a single onboarding-focused push notification to new customers during their first week on the app increased retention by 71% over two months. If you bring new users back and expose them to more of what makes your app great, they are far more likely to stick around and become loyal users. Those are certainly great results, but we found that it is possible to do even better…. Push notifications are an important piece of the mobile puzzle, but push shouldn’t ever be your only outreach channel. We found that you can improve retention dramatically by combining push with other messaging channels. In fact, our analysis shows that when apps ran onboarding campaigns that featured both a push notification and a message sent using a different channel (email, in-app messaging or News Feed Cards) during the first seven days after install, those apps saw customer retention rise 130% over two months. That’s nearly twice as good as push alone!! So multichannel approaches work better, but which channels should you use and when should use them? To make the most of all the different messaging channels at your disposal, you need to understand the strengths of each message type. Some channels are best for rich, immersive content. Others shine when it comes to delivering urgent notifications. Using the right channel for the right purpose is a key driver of success in mobile marketing. For example, our data shows that Push is most effective when it’s used to send short, urgent messages to customers. On iOS, ultra-short messages of 24 characters or less significantly outperform all other message lengths. For Android push notifications, where you have a little more flexibility in the format, the optimal length for messages falls between one and 24 characters, with 25–49 characters messages performing almost as strongly. Either way, short and sweet works best when using Push. This is an important principle for you to keep in mind when creating future campaigns. Personalization is something people talk about all the time, but it’s disappointing how few brands actually do it, or do it well. By taking the information you have about your customers and using it to customize the messages you send on an individual level, you can better demonstrate your app’s value, and also show your users that you know who they are, and that you understand their needs. That enhances the relationship between your customers and your brand, which ultimately translates into better business results. 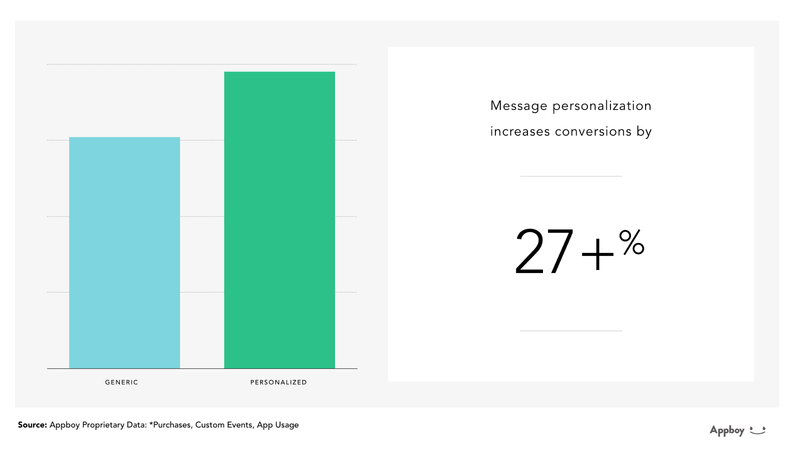 We’ve found that apps who personalize messages see an increase in conversions of more than 27% compared to apps that don’t. Conversions can reflect any goal that you set for the messages you send — like whether a customer opens your app, signs up for a mailing list or makes a purchase — and an increase like this can translate into significant revenue. Best of all, personalizing your outreach is easy. Add each customer’s name to the messages you send. Leverage the information stored on your servers or accessible via public APIs to make your messages more personal, and more relevant. It can be done in minutes and the impact it will have on your campaigns is significant. Marketers have access to more data than they’ve ever had before and all sorts of new opportunities to effectively apply it. Combine that with recent advances in predictive technologies, and it’s now possible for marketers to take a lot of the guesswork out of what they do. One specific feature from Appboy, Intelligent Delivery, is a great example of how transformative predictive technologies can be for improving the performance of your marketing campaigns. Instead of simply scheduling a message to be sent at a particular time, Intelligent Delivery uses historical engagement data for each one of your customers to deliver outreach at the precise moment that recipients are most likely to read it and engage. In our analysis, we found that sending an email with Intelligent Delivery increases conversions by an average of 34% over time-based scheduling. If you’re sending a push notification, Intelligent Delivery will boost conversions by 38%. Intelligent Delivery may not be appropriate for every type of campaign, but if you are running campaigns that are not tied to a specific schedule, you can see a significant improvement in performance by relying on the data and the predictive algorithms to determine when to send each message. Stop guessing, and you will see better results! The channel you choose and the delivery method you pick have a big impact on how effectively you’re engaging customers — but our analysis shows that the creative used in the message itself is just as important for determining success. To make sure that you’re sending the best outreach possible, you should test multiple variants of your message against a control group to programmatically determine which one will drive the best results. By testing different variants, you can ensure that every aspect of a message — wording, color choice, format and more — is the most effective it can possibly be. We found that apps that use multivariate testing to compare different message variants and identify the best possible one before sending a campaign see conversion rates 40% higher than apps that don’t. So start testing your messages — it’s easy and effective and you will see better results. Every app is different. But with mobile acquisition costs at historical highs and poised to rise even further, the brands that are most likely to flourish are going to be the ones who optimize their marketing and messaging strategies to build durable relationships with their customers. To learn more about how to build those relationships, visit Appboy.com. Myles Kleeger has almost 20 years of experience in advertising, media and digital marketing and serves as the chief revenue officer (CRO) for Appboy, the intelligent CRM for a mobile-centric world. He is responsible for all customer-facing activities and functions at Appboy, and focuses on developing and executing the company’s go-to-market strategy as well as managing and scaling a number of departments including sales, marketing, customer success and strategic partnerships. Before joining Appboy, he was most recently Vice President, Strategic Sales for Salesforce Marketing Cloud, where he developed and managed many of the company’s largest brand/client relationships. Prior to joining Salesforce (NYSE: CRM), via the acquisition of Buddy Media where he was the Senior Vice President of Sales, Myles ran the digital marketing practice at Publicis’s Kaplan Thaler Group, where he oversaw all digital advertising, promotional and social media efforts for a range of clients including Procter & Gamble, Wendy’s, Aflac and Continental Airlines. Myles was also the SVP and GM of Alloy Media and Marketing, a full service promotional and digital marketing agency. Myles holds a B.A. from Duke University and an M.B.A from the NYU Stern School of Business. Braze (formerly Appboy) is the customer engagement platform for leading brands. We unite data, technology, and teams to create brilliant messaging experiences.